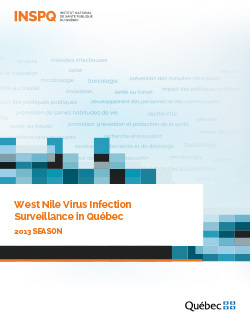 In 2013, integrated surveillance of West Nile virus (WNV) in Québec included epidemiological surveillance of human cases, entomological surveillance of mosquitoes and surveillance of animals, including wild birds and domestic animals (agricultural). During this season, 30 human cases of WNV infection were acquired in Québec, including 29 confirmed cases and one probable case. Of these, 23 (77%) were classed as WNV neuroinvasive cases and 22 were hospitalized, including eight people who were admitted to intensive care and one person who died of meningitis caused by WNV. The average age of cases was 59 years and two thirds of the cases were men (20/30). More than 70% of the human cases occurred in the Montérégie, Montréal and Laval regions. Of the reported animals that were confirmed positive, nearly 66% were found in these same regions. A total of 2,530 mosquito pools were tested for WNV in 2013, and 60 pools (2.4%) tested positive. In 2013, 38 wild birds were confirmed WNV positive by the Centre québécois sur la santé des animaux sauvages (CQSAS) [Québec centre for wild animal health]. The Ministère de l'Agriculture, des Pêcheries et de l'Alimentation du Québec (MAPAQ) [Québec's ministry of agriculture, fisheries and food] also reported eight horses and one domestic Ross' goose infected by WNV.